Come and celebrate with us in Barcelona as The Shamrock bar turns 20 in 2017! Since opening in May 1997, The Shamrock has become the fourth oldest Irish pub in Barcelona. 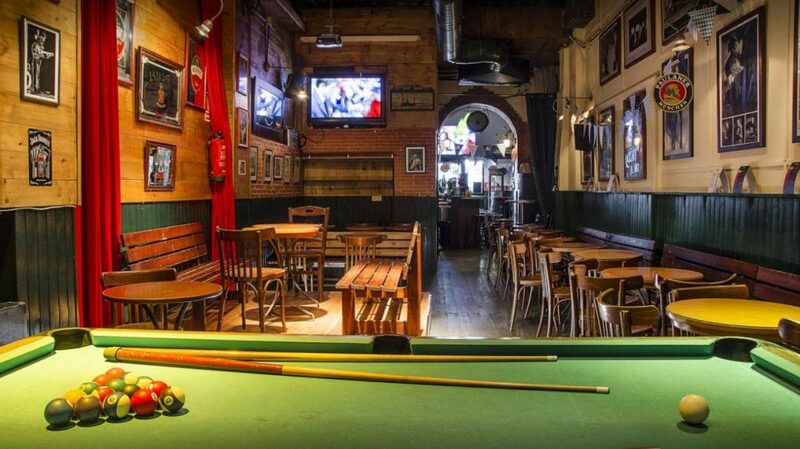 Thanks to its bustling central location in downtown Raval, just a minute’s walk from Plaça Universitat in Barcelona, you can enjoy a mix of friendly locals and travellers in this unassuming rock-and-soul Irish bar. Pedro is the soul and founder of Shamrock bar, leading a dynamic and motley crew of staff where priority is always placed on customer service. It’s no wonder the bar has such a strong following of regulars. Pedro is Andalusian but has roots in both the UK and Spain. You’ll probably get chatting to him when you visit the bar, as he is accustomed to meeting locals and visitors alike. When it comes to sports, The Shamrock has several giant TV screens meaning you can get a clear unobstructed viewing of football and other key sporting events. At Shamrock Barcelona we love Champions League, UEFA cup and the UK/Spanish leagues, as well as rugby, GAA, boxing and tennis! Just ask us if there’s a game you’d like us to show. There’s also a pool table and darts in the amply-sized back room of the bar. Good music is central to Shamrock Bar. It’s easy to see Pedro’s taste when it comes to music; all the icons of rock, blues, soul and jazz adorn the walls. You can come and listen to the best hits from the 60’s right through to modern classics. What’s more, Shamrock is a live music venue with acoustic and jam sessions happening every week on its hardwood stage. We hope to see you at the next house band gig with Pedro’s own Shamrock Blues Rock ensemble. Or how about live imported stand-up comedy in English every month in the bar? Quiz fans can also enjoy the Pub Quiz every Monday. There’s something for everyone! Although Shamrock has a full bar of spirits and cocktails, it specialises in local and imported beers along with quality-approved pints of Guinness. If you’re feeling hungry, you can order something from our extensive pub grub menu; including fry-ups, burgers, curries, wings and other bar food favourites. We hope to see you at Shamrock Bar soon!